Want to catch up on the last installment? Click here. The one called Rurik took two leather bags from his men. He slung the bags over his shoulder, his long legs ranging toward her. The other men assembled around the fire burning near the barn. All were shades of blond save the black-haired one named Erik. His face bore the stamp of Rome. The Forgotten Sons defied a single name. Fighters? Adventurers? Traders? She’d heard there were seven, but she counted only six. They wore similar garb—black from head to toe. Iron hobnails shimmered on their sleeveless leather vests, the same vicious wolf carved on the front of each man. But, it would be hare-brained to say clothes made the men. These warriors were hewn from a harsh world. Powerful muscles molded long limbs. Feral-eyed and bold, they’d take first, ask later. “Northmen,” she said under her breath. Why were they all so enormous? She rubbed her hip. The impression of Rurik’s hand lingered there, the feel akin to a brand, his single touch a command. It had worked. She’d yielded. Yet he’d been gentle, as if he fed on the caress. Now those strong hands tied bags on a pack horse with scarred, agile fingers. Safira stood up, and the Viking’s gaze struck hers a split-second, sending a quiver across her skin. They stood mere paces from each other, but he said nothing as he knotted the leather. Was this a game of will? Who would speak first? She cleared her throat, but he walked around the pack horse, ignoring her. Dratted man. Sun-blond hair bound by a leather thong hung thick as a fox tail over the sword strapped to his back. Long arms stretched in an easy show of strength as Rurik adjusted a saddle. Big muscles shifted with fluid grace, but the Viking was more than slabs of bulk. Fine-tuned flesh bunched under burnished skin, the play of sinew flexing on bare shoulders that curved out from his vest. High on his back, blood wetted sliced leather. “At what?” He ducked around the horse, but not before she caught the profile of his fleeting smile. He knew she’d watched him, and he’d waited. The smooth timbre of his voice lacked the booming quality of Bjorn or Thorvald, yet it was deep and pleasant. He gave orders. Bjorn saw them done. This was a disciplined arrangement for the tight-knit warriors. She’d heard they fought and roamed, never staying in one place for long. Rurik must see her as goods to be hauled to Paris. Wasn’t that for the best? “Such as?” Eyes the color of storm-tossed lakes met hers. Hard, forceful, intelligent. Her flesh tingled against her tunic. Rurik, a coarse warrior from the land of ice, seared her. 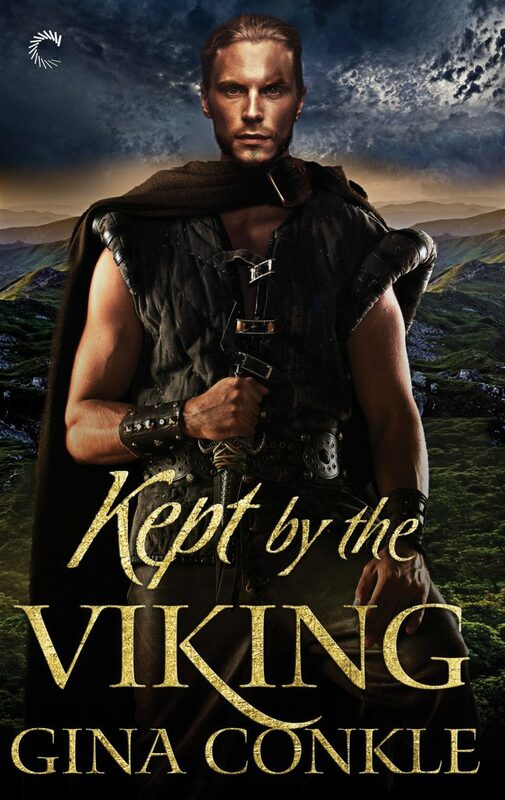 Women in Sothram’s household had whispered of him, the once impoverished Viking boy of Birka now a man widely respected for his fighting skills. He came from the lowest stock yet elevated himself by strength of will. And she was putting her trust—most of it—in him. Heels dropping to the ground, she averted her eyes. It was true. He was her instrument of freedom. Without the warrior’s protection, getting home was nearly impossible. The Viking consumed all the air. Hemmed in by animals and man, she had nowhere to run, nowhere to hide. Her feet shifted, and she was intensely aware of being a woman with a man. A breeze played with Rurik’s hair, showing a piece of his left ear was missing. On his chest, blood smeared the snarling wolf carved in his leather vest. The ferocious, round-eyed creature stole her attention the way snake charmers wooed a viper from its basket. The sign of the wolf. 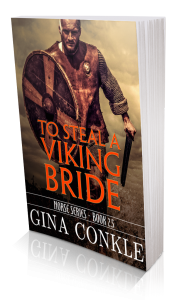 Before she was stolen, worry had rippled through Paris, talk of wolves joining Will Longsword, the Count of Rouen, as the Franks called him, Jarl and Chieftain to the Vikings. It was said Will Longsword, son of Rollo, thirsted for more land. The people of Paris fretted inside the beautiful citadel, fearing the son would take up his father’s old path, attacking Christians and demanding a Danegeld of gold and silver to leave them in peace. Was she standing before Longsword’s newly favored wolf? A man who would one day come to burn her home? She blinked fast. He was talking about sharing his bed. Or laying with one of the other Forgotten Sons. Like the frilla he’d assumed she was this morning. She’d learned the Viking word and the emptiness it meant. Concubine. Comfort woman. A nameless, faceless object of sexual pleasure. She would have none of it. Rurik made the arrangement sound as if this were a practical matter, yet his eyes narrowed, severe, unwavering—a predator’s eyes before he pounces. A chill pebbled her skin. Male laughter came from the barn. The warriors broke from their discussion and headed their way. An awful churning tore through her stomach. Slaves made fair game for Viking lust. For the good of many, she needed to return home untouched. Her chin jerked free. The choices were stay with the Saxon and his vicious wife, brave the forest alone and try to get home, or trust these Vikings. She didn’t even know how long the journey was to Paris. Her coming to Sothram’s outpost had been a horrifying blur. Around her, men checked their saddles. Horse hooves stomped the ground. The men called Gunnar and Bjorn secured round red and black shields to their backs. Rurik took his shield off the ground and did the same. The Forgotten Sons would leave her and not think twice. This was what happened to a woman who trusted a Northman. She’d not get tender care; she’d get survival. “We’ll call it thrall’s choice.” Rurik’s eyes flashed a warning—Don’t play me for a fool. Her mouth went dry, and she’d swear the sun beat hotter though she stood in the shade. The Viking toyed with her. He’d already called out her seeress claim. Nor did he believe she was a thrall. The lie was her last shred of defense. She’d hold fast to it, especially among these men. The one called Thorvald mounted his horse and scowled at her. More beast than man, his craggy face had seen its share of fights. Restless warriors put on basinet helmets, their harsh stares tracing her from within iron eye rings. Strong hands grabbed her by the waist and lifted her off the ground. Astride the horse, her torn hem rode up to her knees. Her hood fell back in the scramble to cover bare legs with the cloak, but the thin barrier couldn’t stop rough-skinned fingers from encircling her ankle. Carnal heat crept up her thigh. She grabbed the reins and twined her fingers with the leather, fighting the urge to yell stop! The Viking had charge of her now, in their uneasy alliance. The corners of his mouth curled up. Under the cloak, his hand rested spread-fingered on her bare knee. Warm. Possessive. A tender show of power. The Viking leader knew his wayward hand flummoxed her. By the humored light in his eyes, he took as much pleasure in the vexing as he did in the touching. Satisfied male laughter rolled up his chest. He patted her knee and, in one lithe move, let go and mounted his war horse. Rurik put on his helmet, the iron nose guard nicked. A warrior lobbed a crude jest about riding long and hard. The men laughed. Cheeks burning, she raised her hood. Her limits would be tested on this journey. It didn’t matter. She was going home. Rurik galloped past Sothram’s open gate, dirt clods flying under his horse’s bowl-sized hooves. His men trailed in a thunderous wake, the pack horses chasing them on long tethers led by the one called Thorfinn. All went save Bjorn. The giant circled the grounds atop his massive white steed. The door of Sothram’s feast hall cracked open. Hilda. The woman’s flat-lipped glare seethed, daring Safira to cast her lot with Vikings. A surge rushed through Safira. It was the yearning to reclaim her life and the strong desire to see her family again. The one called Bjorn didn’t have to ask twice. She urged her horse to a gallop and followed him to freedom. Wind blew her hair and whipped her cloak, giving her loose-limbed ease, the first since she’d been stolen at the last full moon. Leaving the Saxon’s outpost was easy. Keeping Rurik from touching her come nightfall? A welcome test of wit and will. Grab your copy to find out what happens next.